It is dununa reverse-this time a real one. 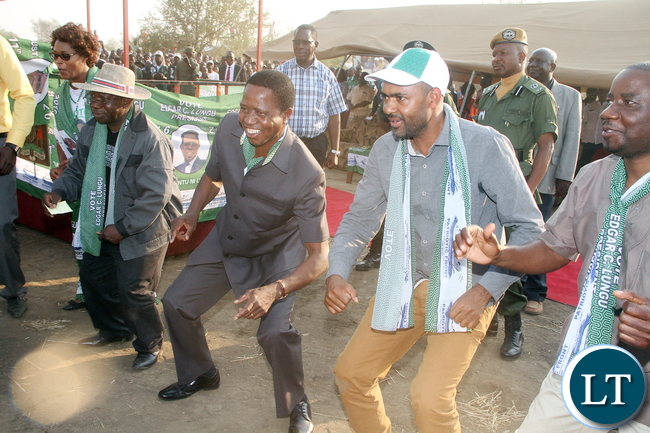 It is only months since President Lungu was re-elected, but it seems ages.I mean years of dancing dununa reverse! Unlike the Titanic, the PF boat is sailing without the Captain. President Sata is in tears as he witnesses his icibwato sink while Lungu is busy dancing dununa reverse in state house. Ubwato nabubunda-unless something dramatic happens, only a mad person hopes that PF will sail to 2021 victory.Another reason I find discussions on whether Lungu qualifies to contest the next elections time-wasting. President Lungu described himself as a very “good” Lawyer. Regardless of one’s reaction to his claim, it seems he forgot to add two critical qualities that have characterized his administration-a very good dancer, and a legendary comedian. I realize PF cadres are in denial but the current situation in the nation makes one wonder which Lungu is ruling,a smart Lawyer, a great dancer or a comedian! A smart lawyer would have realized that the PF is in muddy waters . It is ichishala of thieves, who steal from, and abuse citizens and then boast about it! A good Lawyer would have known that HH is a free citizen with rights to free movement and association. A good Lawyer would have known that the police exist to protect citizens and not to abuse them. A good Lawyer would have recognized that we are all Zambians regardless of our party affiliations. So why does Lungu allow insane people to override the rights of fellow citizens simply because the refuse to join dununa reverse? President Lungu is a good dancer,only next to the legendary Amayenge dancer, the late Chanda Beu! Dancing is good, it makes us forget our plight! This is why the poorest crowd political rallies and dance dununa reverse or forward to impress the rich. They are interested in music and not policies. Lungu knows this and dancing dununa reverse was a great political strategy. Sadly, the music has stopped and it is now time to live in dununa reverse–and reverse our beloved country is going. But who can blame a comedian for dancing without the music,it is what they do! Honestly, Chintelelwe is a better Mwine Mushi than Lungu. How can the President allow Davies Chama to promote corruption and lawlessness in a public speech and remain silent? The Zambian media is preoccupied with his call to PF cadres to takeover bus stations–but it is minimal when compared to his directions to give almost half of the plots to PF ward chairpersons and the displacement of UPND cadres selling in streets in Kabwe. This guy is insane. He is a criminal with a criminal mind–he belongs to Prison or Chainama mental hospital! But who cares–Lungu says the madman is going nowhere! Then came the late delivery of farm inputs and armyworms. This situation is highly disturbing. Lungu would have resolved this problem if he was not busy dancing dununa reverse. Lungu was in power before August 2016. The fact that he did not put measures in place for agriculture shows how incompetent he is. If he had Zambia at heart, he would have made plans for farm inputs long before the elections. Some people feel that Lungu’s agriculture policies are being sabotaged by some civil servants sympathetic to UPND,which may be true given the closeness of the elections. Civil servants are citizens with political views hence they have the right to support UPND or PF. But Lungu is the President for all Zambians,both PF and UPND. It is his duty to manage such situations and his failure to do so speaks to his incompetence. Similarly, the comedy that characterizes the PF- Kambwili saga is unsurprising. I have no respect for Kambwili,he was the loudest mouthpiece of Lungu and biggest dununa dancer until fired! Regardless, Kambwili was not the only corrupt minister in PF. We only prosecute corruption when one is out of favor with Mwine Mushi. Ask Mutembo Nchito, Masebo, GBM, Meembe,the list is endless! Shouting Pankoloko or pabwato made them millionaires! When they refused to dance dununa reverse -so fast came their end. Heaven is our witness. We don’t need the ACC to know that Kambwili was not the only corrupt politician under the PF government. If we have to clean house, even Lungu himself will be in prison together with all his dununa dancers. Ifintu ni Lungu and Dununa reverse are dead slogans -come 2021 people will dance dununa reverse when they mean Forward. I pray that HH will not be fooled by the dance! What a poorly written piece of trash by Kapya Kaoma. If this is the calibre of intellectuals in UPND (United Ponyio Nyio Dogs) then we are better off with gallant, victorious Patriotic Front. Kaoma in your blind hatred you’ve even mentioned Davis Chama, a hard working Minister of Defence. The FO0L you are referring to is probably Davies Mwila who was ranting in Kabwe. Iwe just face the truth. PF doesn’t inspire anymore. Many people who voted for PF last year are regretting their action. They are disillusioned. Kudos. This is the most irratting commentor on LT. LT please block whoever this fool is. Always insulting and talking about HH. I am not an HH support but as long as the petition remains unheared. Lungu’s presidential legitimacy will be in question. Lungu should have allowed the petition or court process to be full exhausted so that if he was proved winner after evidence was assesed then everyone will have to congratulate him. The reason all these corruption things are happening without action from the president is these people hold him ransom to the truth. If he did do the right thing and they told the truth about the corruption and irregularities of the elections. Lungu would have some tough questions to answer. @kudo, You avoid real issues and head straight to insults and characterizations! How about an adult conversation! Address the issues raised with facts and not rants. It’s people like you who have brought down PF and Zambia. Dont pay attention to characters like Kudos! He is just another Visionless id!ot like Edgar Lungu. I think Kudos has a valid point. Reviewing what Kaoma has written, it live much to be desired in intellectual discourse. He is writing a grade 7. UPND has a serious shortage of people who can intelligently debate and provide alternative views that are without insults and vulgarism. How can a senior leader, like Kaoma lamentably fail to talk about issues instead of talking about dancing, etc. What has dancing to do about intellectual and political or socio-economic discourse. It is very strange that even HH also has the same disease. The opposite is very reall for PF and its leaders. They are not emotional and seem to do alot of research before they respond in the press. The UPND and HH can only offer insults in response. What a shame!!!!!! But na dabwa, Ba Kaoma now agree that ubwato sunk? This article is hilarious, read a paragraph and glance back at those PF comedians… ati even Chintelelwe is better. Its true, Lungu looks behaves like Kasaka. I think there is something seriously wrong with the leadership of UPND. It is either they have run out of ideas or simple do not know how to tackle PF. PF is in full control as a ruling Party. Lungu has defended his Presidence and has settled in power. It is surprising that Kaoma can write this trash and miss out on discussing issues. Remember, this is exactly why you lost as UPND, vulgar language. Zambian, I mean well meaning Zambians and nit regionalists, rejected you HH because of your language. Lungu, whether you like him or hate, he beat you dull politician HH 2 times hands down. Lungu has a vision and part of it was to beat HH and UPND and he did. never read a book by it cover. Zambians rejected you tribal party and regional party. We know it pains you behind so much,but you lost and no amount of insults will change this fact. It will not degrade anything concerning Lungu and PF. You thought you can divide Zambia using your tribal and regional tactics, but Zambian defeated your HH and UPND. This will be done again in 2021. I was also one time under a Tonga boss and he made my work terrible. He victimized us and brought in his fellow Tongas and many non-Tongas were either fired or forced to leave. HH will never be allowed to rule Zambia until you are mature and stop your tribalism. Even the Westerners and North Westerners are just being used for your tribal intentions. NEZ, you just wasting your time. Zambia is bigger than one region or tribe. We have decided!!!! NO TO HH and UPND. It done, sealed, delivered and settled!!!! Ingombe ilede mentality. You are still in stone age. Get civilised. What is wrong with your DNA,filled with cow dung? No amount of education or money can change your type. You can take a villager to the city but you cannot remove the villager from him (NEZ, HH and entire UPND). Live to be happy and continue celebrating. If chikubaba, we do not give it a damn. For us ni all smile chabe!!!!!!! NEZ where is the UPND secretariat in Leeds or your frequent watering hole? If by chance OVAL HEAD become president in 2021 I will support him and regard him as my president. That’s what we mean by democracy. Our friends in the opposition have lost the meaning and touch with democracy. To them only when OVAL HEAD is president then they will say we have a president. Grow up you cretins. We are all zambians including OVAL HEAD. Why is lungu harassing HH ?? On the contrary it’s HH who’s harrassing himself bye living an impossible dream. Ba Kapya Kaoma, what exactly do you want the government to do for you. Each morning when you wake up and ask yourself your plans for the day what exactly do you expect the government to deliver at your door steps? Kabu, they can resign and let others with better ideas take over before it gets worse. Ba Kaoma, me and the rest of law abiding citizens pay our taxes in the hopes that it is wisely utilized to our benefit. That is not the case, have you seen how these ministers have suddenly become rich. You saw a glimpse of the stealing from Kambwili’s case. As it is now they are failing to prosecute him because he vowed to expose them. Do not forget how HH became suddenly rich well many Zambians suffered due to his complicated theft. He has never explained how he amassed his wealth. Why is it such a well guarded secret? We begin to assess our government for performance about a year befire the next elections. That is because we give sixty moons to every President to do his work. We also know that in those sixty years there will be up and downs but the assessment will be on overall performance. It seems UPNDonkeys and their so called economic manager are not aware of this and so by the next elections they have burnt themselves out with inconsequential donkey gibberish. I suspect the guy has been left out of the appointments. Ba ndanje what about you have you been appointed Kiki busy been a cadre for mahala. Comment:nez too bad for you I don’t feed on politics and my detest for your Upnd is its tribalitic statements by your leaders which HH has not condemned. Having worked under a tonga director I know that putting one in State House would spell doom for Bemba speakers. Learn to articulate and substantiate your clams with facts that can be proved, learn from the Mwine lubemba ‘s articles. We need to hear and learn more from people who have solid information about the wrongs and criminal dealings of our leaders, but imotional un verifiable attacks on any one will not help the majority Zambians to make right decisions in future . I read another one of your articles not long ago, and I could see how you brought out certain issues with a sober approach , but on this one you sound very bitter and descruntled. Don’t show yourself inclined to any side without meaningful popular reasons. I live in the USA I came for three months visiting my family. Where ever I went people who voted for PF Lungu were saying it would not happen again to vote for Lungu. Am Bemba from Kasama I neither supported PF nor UPND. People are suffering, there’s high level of poverty no wonder Chinese or Indians can abuse Zambians in such a way because unemployment is high. Corruption is the order of the day. You cannot even construct a correct sentence. You never start a sentence with ” Äm Bemba from Kasama…” This is very wrong syntax. In fact, it is very easy to tell you are not Bemba from Kasama because this is a typical style of UPND fanatics who want to masquerade as Bembas to give the impression that PF has lost support in the northern regions of Zambia. This is the self-deceptive propaganda UPND fanatics have now resorted to in order to console themselves that they are still relevant and popular in the current political dispensation. You need to open your eyes! PF boolshlt has turned your brains into kaka. Lots of cheap talk but go and see what is actually happening on the ground! How call your self a free slave. Are you implying you are still a slave but free from thinking correctly? Well having said that, I think it you and your UPND leaders who speaking illogically and emotionally as a result of your lose. It is painful to lick you own wounds, but that is the name of the game. You must be ashamed of having such under 5 leaders. You will die to frustration because you will not change the status quo, that is PF in power and Lungu PRESIDENT of Zambia. CHIKUBABE, who cares!!!!!!!!!!!!!!!!!!!!!!! !We are IN POWER!!!!!!!!!!!! And you still eating cow dung and dust!!!!!!!!!!!!! Ba JM enjoy your stay there and leave Zambia to us. We will await your coming back. My advice is save enough and send money for your family to invest back home. It was sad seeing people on tv asking for donations to help bring the remains of their beloved ones. This is very true. Lungu as a lawyer has very worrying tendencies to break the law at will. May be his losing his licence to practice law because of fraud is an indication of his character. The unemployment levels in Zambia is propitiate to the national population. When we had a population of 3000,000 the ratio only 1 person had a decent job out of 5. KK brought in parastatals with a view of reducing this gap but unfortunately these companies were sold off by FTJ and colleagues. The buyers simply removed the machinery and took them abroad. Now the population is over 15million and no significant industry has come up in the last 25 years since MMD took power. We’ve been relying on mine investors whose main aim is to make a quick profit and leave at the least sign of problems. Talking won’t solve this problem and neither will theories. The colonial rulers ensured villagers remained in villages and develop them instead of coming to town and establish shanty compounds. Zambia is for all of us . Whether I live in diaspora I will remain a Zambian. I have to be concerned with the affairs of the country. If your are happy with the way the affairs of country are being run, and you are assured your children will inherit better Zambia good for you. Kaoma you have been asked a question what do you want the hard working government to bring to your door steps? Who in there right mind can shout Ifintu ni Lungu even your 5 year kid would ask you why you shouting that on an empty stomach…the likes of Kambwili have cut deals to shut up and ACC have restrained….what happened to investigations going smoothly. How can an old person sit down and write such a useless article. He is talking about nothing but merely insulting Lungu. Already talking about PF losing the 2021 election. It seems people never learn. You f00ls have been singing that song forever. Just accept it. You are political failures and admire Lungu. In the given situation, Lungu is well heading in the right direction. There re few countries in Africa you can compare to Africa in managing a complex country such as Zambia. Just look around, Zambia has food and is helping neighbours. Look at the peaceful environment. Look at the tolerance, even as you insult the leadership no one is being arrested. Try that in some African countries. So far so good. I and my clan would still vote for Lungu should elections come today. As for 2021, it may be a bit far to comment. It is good PF won. My friend working in Choma was told that if HH won he was going to be chased from Choma. How do you inspire voters with such a language. God gave us Lungu for a purpose.